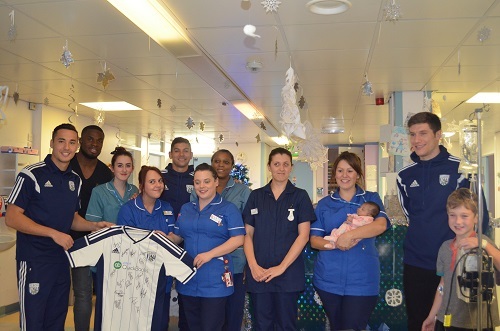 CHILDREN on the paediatric wards at Sandwell Hospital were thrilled to see players from Premier League West Bromwich Albion visiting with Christmas presents to deliver. This annual visit by ‘Baggies’ players is always popular with staff and patients. This year was the first visit for Belgian international defender Sebastien Pocognoli, who signed for the club in the summer. “The other players told me how they genuinely look forward to this and I understand why. It is always good to see the smiles you can bring to the children’s faces,” he said. Thank you to the club from Sandwell and West Birmingham Hospitals NHS Trust.